Studiodaily has a fluff piece for Customflix which caught the attention of HD4NDs. Step by step instructions. Pretty easy looking, actually. If you have an indie produced film with no distribution deal, this is one way to get it out on the market (albeit with no marketing, and closing off other distro deals). For an indie filmmaker who’s spent a chunk of their life and all their savings on a project this may be a last resort. For a visualist producing loop or installation DVDs this looks like a great option, giving you a professionally printed disc and case, and listing on Amazon (and Amazon Unbox for downloads). Their prices seem quite reasonable. Of course revenue share varies (95% for customflix’ own store, 35% for Amazon, 50% Unbox), but for a passive distro in which no large initial outlay for pressing and no continued time for payment processing and shipping is required I’m not going to argue. 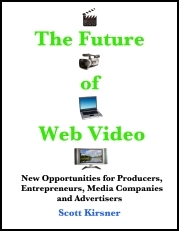 In related news: CinemaTech‘s Scott Kirsner has published an excerpt from his book The Future of Web Video: New Opportunities for Producers, Entrepreneurs, Media Companies and Advertisers, listing 20+ sites which will pay for video content. Specifying whether they’re paid per view or click, revenue share etc. This compares Customflix with the other major offerings. Some interesting options there if selling stock on iStockVideo hasn’t quite turned out how you’d hoped.